One of the findings in the 2018 WestED K-12 cost study is a high level of efficiency in school spending, with efficiency in case meaning ‘bang for the buck.’ However, a study just released by the Cato Institute says 30 states do better than Kansas when spending is adjusted for cost-of-living variances. Dr. Lori Taylor, the author of the WestEd report, claims for Kansas schools “the average cost efficiency score was 0.956, indicating that buildings were producing nearly 96% of their potential output, on average.” By “output” Dr. Taylor means state assessment test scores. That conclusion was built on the (false) premise that test scores are determined by the level of funding, so based on the amount being spent, test scores should be at a predictable level. Scholars across the country, including those writing for Kansas Policy Institute, have shown over and over that honest review of the data refutes claims that achievement is dependent upon the amount of money spent. Kansas ranks 25th based exclusively on NAEP scores. When combining those two factors, Kansas falls to 31st among the 50 states and D.C. This means that there are 30 states that get a better outcome bang for the buck than Kansas. Included in those 30 states are three Kansas neighbors: Colorado (9th), Oklahoma (26th) and Nebraska (29th). Missouri immediately follows Kansas in the rankings at 32nd. Florida and Texas are noteworthy. 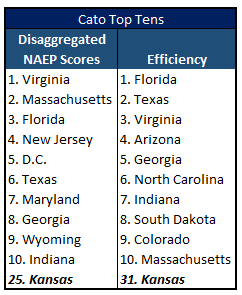 As the table shows, those two states rank third and sixth when just analyzing NAEP scores. However, they jump to first and second when considering those scores based on per-pupil spending, while Kansas tumbles from 25th to 31st. Not only do they do their students perform strikingly better than Kansas on NAEP scores, they do it spending considerably less money. According to the latest data from the National Center for Education Statistics (NCES), both Florida and Texas have higher student outcomes while spending about 12% less than Kansas. Of note is the diversity of per-pupil spending in states ranked higher than Kansas. Traditionally low spending states like Utah and South Dakota, along with high spending states like California and Massachusetts get better per-dollar outcomes than Kansas. 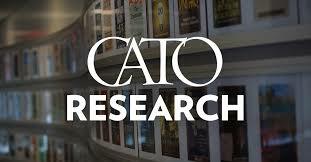 What makes this case even stronger is to realize that the Cato analysts used a norm-referenced nation-wide test – NAEP – as opposed to the subjectively scaled and leveled Kansas state assessment that was employed by WestEd. It should come as no surprise that the highest ranked state in terms of outcome efficiency is Florida. The Sunshine State has become the gold standard for improving test results without breaking the bank. Florida is on the cutting edge of education reform – being student focused rather than institution focused – and the effort has obviously paid off. As KPI reported in this article, Dr. Taylor admits that Kansas districts are extremely efficient relative to each other, not in absolute terms or relative to other states. ‘Relative’ is the key distinction here. Kansas school districts could be very inefficient in absolute terms, but in comparison to each other they’re about the same. That’s ‘relative’ efficiency. That’s a critical distinction, especially given the never-ending Gannon case. If it’s true that schools are operating at near-peak efficiency in terms of student outcomes, the only way to improve those outcomes would be to give the schools more money, as the WestEd study concludes. On the contrary, as Cato shows, Kansas is nowhere near peak efficiency, meaning it’s not additional dollars that are needed, it’s better use of existing dollars – see Florida – that will improve student outcomes.